ROPE LIGHTS ARE PVC TUBES ILLUMINATED BY TINY INCANDESCENT LIGHT BULBS INSIDE. DUE TO THE FLEXIBLE NATURE OF THE PVC MATERIAL, THESE ROPE LIGHTS ARE OFTEN USED TO OUTLINE WINDOW AND DOOR FRAMES, TREE TRUNKS AND ROOF TRIMS. WE SELL ROPE LIGHTS IN SPOOLS OF 150 FEET, BUT YOU MAY CUT THE ROPE LIGHTS TO YOUR DESIRED LENGTH; THEY ARE CUTTABLE EVERY 24 INCHES. ROPE LIGHTS ARE DESIGNED TO BE USED INDOORS AND OUTDOORS. 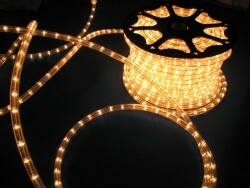 THIS KIT INCLUDES 150 FEET OF ROPE LIGHT, 3 POWER CORDS, 3 SPLICE CONNECTORS AND 3 END CAPS.